I completely forgot about this after having mentioned it earlier this month, but John Gardner’s final novel No Human Enemy was published on August 27th in the UK. Gardner passed away on August 3rd. No Human Enemy is the fifth book in the Suzie Mountford series that he started in 2002 with Bottled Spider. 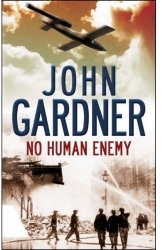 I’ve actually never read a John Gardner novel outside of his Bond series so I’m not even really sure what to expect from this, but Gardner writing thrillers in and around WW2 sounds rather promising. The book can be picked up on Amazon.co.uk. Thanks to CBn for the reminder.